To say that the 1950s or ’60s were a simpler time, that America was perhaps greater, is to erase a guilt-ridden time from history. I’m tired of hearing that the 1950s and 60s were a simpler time. This statement doesn’t consider rampant discrimination based on ethnicity, gender, sexual orientation, age, ability, or religion. To address all the reasons why the ’50s and ’60s were not the Halcyon days that some croon about would take a tome. Let’s address just one form of discrimination. Because it coincides with an important anniversary; the murder of a young boy. Emmett Till was a 14-year-old black boy, lynched in Money, Mississippi, on this day, August 28, in 1955. Emmett Till’s crime: He whistled at a white woman. Emmett grew up in a middle-class neighborhood on the south side of Chicago, an area with many black-owned businesses. Till’s mother, born Mamie Carthan, was raised in the Chicago area by parents who moved from Mississippi as part of the Great Migration, a period when 6 million African Americans fled states with laws that discriminated against blacks. Emmett, known as a responsible, funny, and infectiously high-spirited child, was not familiar with the Jim Crow ways of the south. He didn’t know the dangers of flirting with a white woman. While visiting his uncle in Mississippi, Emmett joined friends at a local market. He went to buy gum. While there, he showed interest in the female store clerk. Four days later, in the wee hours of August 28, 1955, the store clerk’s husband, Roy Bryant, and his half-brother, J.W. Milam, kidnapped Emmett from his uncle’s home. The two men beat Emmett, shot him in the head, then used barbed wire to tie his mangled body to a large metal fan and threw him into the Tallahatchie River. Despite overwhelming evidence that Bryant and Milam committed the heinous murder, an all-white jury found them Not Guilty after one hour of deliberation. One hour. That’s your commute to work. That’s your weekly grocery shopping jaunt. Think about it. Or how about Rosa Parks…have you heard of her? She was arrested for not giving up her bus seat in Montgomery, Alabama, in December 1955. Rosa Parks’s crime: She wouldn’t give up her seat to a white man. Parks wrote, “The news of Emmett’s death caused me…to participate in the cry for justice and equal rights.” It was indeed a turning point in the struggle for civil rights, but it was just the beginning. The 1960s saw the height of the fight. Let us dwell on a man named Medgar Evers, who organized voter registration efforts and fought discrimination; murdered in 1963. Then there’s Malcolm X, civil rights activist, murdered in 1965. And Dr. Martin Luther King, Jr., Nobel Peace Prize winner, whose legacy is larger than life, murdered in 1968. What were the crimes of Medgar Evers, Malcolm X, and Dr. King? They were blacks who worked tirelessly to upend discrimination. Perhaps the height of carnage occurred in Selma, Alabama, in March 1965. Images of Bloody Sunday are haunting. 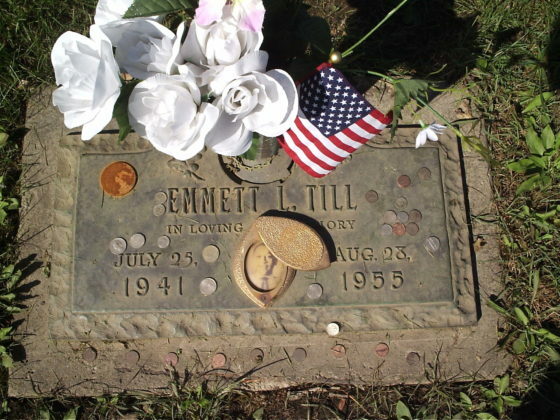 Emmett Till would have celebrated his 76th birthday a few weeks ago. Instead, this Sunday marks the 61st anniversary of his brutal murder. The day a bright light was extinguished…a mere boy was murdered simply for being black. I live a short drive from Burr Oak Cemetery where Till and his mother are buried. It’s heart wrenching to see his smiling face on a tombstone; a picture where his mother’s arm protectively surrounds his shoulders. She couldn’t protect him, but she captured the attention of a nation when she insisted upon an open-casket burial for her son, showing his mangled, unrecognizable face that was once beautiful and filled with hope. Let us all remember history cannot be erased—but is written each day in how we carry out our lives and treat each other. Speaker, Freelance Writer, and award-winning author of The Female Assumption (2014 Global Media Award for Best Book). Holmes writes about diversity topics, including women’s history/rights and social justice for all. She blogs at www.MelanieHolmesAuthor.com and is active on Facebook.